For a gal that’s directionally challenged, I steer clear of maps. I’ve never been good at reading them. So I don’t. In fact, I have other people drive me around just so I won’t get lost. It’s true. Sometimes I feel like the Scarecrow in the Wizard of Oz, when they ask which way and he gets confused, flailing his arms in all directions. That’s me. I’m glad that God’s roadmap isn’t confusing like, well, every other map. I read the Bible and I know exactly what direction He wants me to go in to become more Christlike. Every page I read tells me where I am and how much further I need to go in one direction or the other. The key is actually stopping to read it and find out where you are. I’ve been the spiritual wanderer, mostly because I was too stubborn to stop and look. I’m still that way at zoos and amusement parks. I never look at a sign. I just wander aimlessly, in complete circles…and more circles…seeing the same old things. Never experiencing anything new. Eventually, I’m confused, frustrated, and too tired to stick it out. I lose out on making memories, experiencing wonders and rides. If you feel that way, spiritually, stop and read the “sign.” It won’t take long before you see the “You Are Here” and are pointed in the right direction. And along the way, you’ll see new and amazing things. And maybe, I’ll take my own advice and actually read a sign when I’m at the zoo or amusement park. It’ll at the very least make my husband and kids happier! I’m sitting in my chair, listening to Pandora. Missy Higgins station to be precise. I’m pondering my life. Goals God has for me personally, in my family, my ministry, my writing. I take the first 21 days of January to do that–filling up journal pages with whispers of what I need to do. Where I need to go. What I need to drop off in the refiner’s furnace. Tonight, I’m wondering if I was a book where would I be placed? What shelf? Most of my friends would say Chick Lit, if they knew what that was. On a bad day, maybe horror. Some days I can’t find up from down, so maybe a mystery. I wonder where God would place me? I hope to be an epic tale full of Divine romance, suspense, mystery, with some Chick Lit humor, but I have no idea where that mixed genre fits on a shelf. Truth is, I’m an unfinished work. I’m constantly being tweaked and revised before He sprinkles out my pages to others for reading, to hopefully inspire their hearts and encourage them. To sharpen them like iron. One day, I’ll be finished. Complete. Just the way He intended for me to be. Will millions have the opportunity to read the pages of my life and be ministered to, inspired, touched? I don’t know. But some will. At least some. I’m looking forward to the day when that last page is turned and my Author steps down sapphire stairs to greet me on crystal waters. I can hear the angelic choir softly harmonizing with the saints but I keep my eyes on the burning flames that are gazing right into my very soul–his beautiful handiwork. He’ll be careful not to dog ear me. He’ll turn the pages as if it’s a beautiful, miraculous dance. Each turn, like a soft kiss. If you were a book where would you be shelved? What would you like the pages of your life to read like? 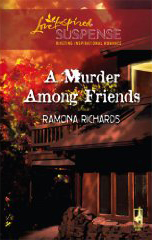 A gripper from the beginning, A Murder Among Friends, is a very entertaining, suspenseful and spiritual book with a lovely romance. Ramona’s characters were easy to slip into. I think you’ll find at least one of them you will identify with. It’s a 269 page read. For avid readers that shouldn’t take too long. A day…a few hours. Worth the time for a fast paced action packed book. Her dialogue is flavorful and real. I’m picky about my dialogue, so I pay close attention to other writers and how they do it. She happened to keep it fun, flirty, and emotionally charged. A+ Her description of the writer’s retreat felt very real, down to the soggy leaves from the rainy days. Everyone is keeping secrets, pretty much everyone has a motive and it was on page 200 that I dropped my jaw because I hadn’t totally figured out who was behind the murder. I do love surprises! Her backstory was wonderful and well written. I felt like I knew Aaron and that made me care more about him being dead. That is NOT a spoiler alert. The book dives into the murder on page one and of course the title gives it away! Christians make mistakes–big ones in this book, giving Ramona the opportunity to weave God’s grace and love through every page. I think it’s a tad over $3.00 on kindle at the moment. Take the opportunity and read it and of course, drop back by and tell me what you thought. “The death of bestselling author Aaron Jackson turned Maggie Weston’s world inside out. The manager of Jackson’s Writers Retreat, Maggie knew a murderer hid among her colleagues and friends. Was it actress Lily Dunne, target of a stalker’s obsession? Lily’s writer husband, struggling to make a name for himself? Money-loving Korie, Aaron’s wife? Or someone else? Maggie herself stood to inherit from Aaron’s estate.